Nothing beats drawers for convenience. Faucet works great. Sink is a nice shape and generous size. I like having the flat surface on each side of the faucet to place the soap dispenser. It’s all shiny and pretty. Fits well in my small Manhattan bathroom. Wanted small without sacrificing ergonomics and practicality. This was perfect. Have it for a few months to date. This is my first free standing vanity and I am so pleased. It has just the right number and set up for drawers, love that it’s a bit higher than the old vanities (and I am a short person), and I have nothing but raves from guests to guys doing my remodel about how nice it looks. 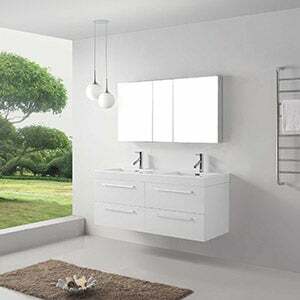 Virtu USA provides a line of contemporary bathroom vanities that will elevate your home with their sleek designs, frosted glass doors, and modern finishes. 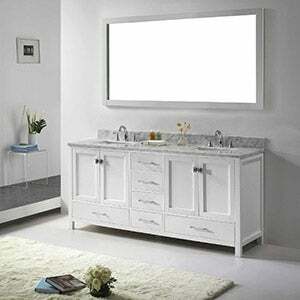 Experience the diverse line of handcrafted Virtu USA vanities that offer the highest blend of quality, reliability, and design. 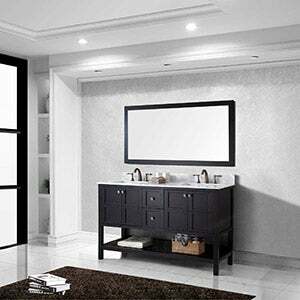 Explore a wide selection of stand-alone vanity cabinets and enjoy the freedom to be flexible and customize one of the most important rooms in your home with Virtu USA. Expand the functionality of any room by choosing one of these Virtu USA storage options that were built with an emphasis on craftsmanship and with the highest attention to detail.